In a bowl, mix Cracked wheat & Moong dal. Wash well. Add Water & pressure cook for 3 whistels. 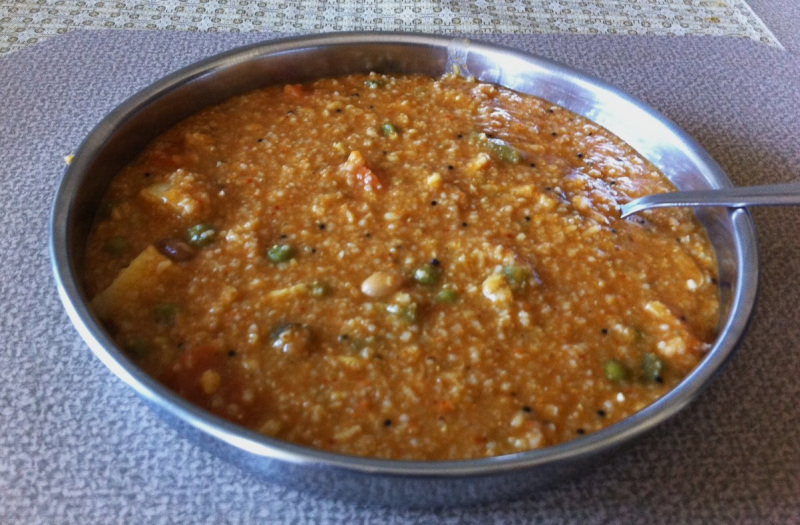 Boil vegetables directly or pressure cook them seperately along with Moong mixture. In a deep pan, heat Oil. Add Mustard seeds, Hing, Curry leaves & Red chillies. Add Tamarind water, Turmeric powder & Spice mix powder. Let it boil for 4-5 mins. Add Wheat & Moong mixture to it & mix well. Add Salt & boiled Vegetables. Mix well gently & boil for 5-6 mins until slightly thickens. Turn off the heat, top it with Ghee & cover a lid for 5 mins. Serve hot with your choice of raitha or chips. Adjust thickness according to your choice. Hi ! A very Healthy and Wholesome meal . Thank U . Cracked Wheat (Bulgur) is an Excellent source of Fiber and other important nutrients such as Selenium , Potassium and Magnesium .